Fabric Insert at Front Toe with Bow. All Leather Insole & Bottom Sole. Condition: Very Good Pre-Owned. Slight Wear. Patent Leather is Excellent. No Issues. Heel Height: 1 1/4”. A LL White Spots on Shoes are Reflections. Wedge Shoes. G. H. BASS. Round Toe Pump. Black Patent Leather. COLE HAAN DARLEEN SHOE. Cole Haan shoe cover is included. Material - Patent Leather. Heel Height approx - 1-1/2". SEE PICTURES FOR VISUAL CONDITION & CONDITION OF SOLE (USE ZOOM). Color - Black. Superb pre-owned condition. Hardly a sign of wear. Enlarge photos for details regarding condition and appearance. This item was cleaned with a professional cleaning agent to endure best quality. SILVIA FIORENTINA, SUEDE AND PATENT LEATHER PUMPS - MADE IN ITALY, SIZE 8 M. Condition is Pre-owned. Shipped with USPS Priority Mail. Emory Wedge Shoes Wedge Heels. A corded strap with a bead detail gives just enough interest to this versatile style. I am not a professional photographer but I try my best, however, the color may not be the tone or hue of the item. LOW WEDGE HEEL. S UEDE & PATENT LEATHER. Designer/Label - Taryn Rose Pamona. This section will auto expand to fit your content. Material - Patent Leather. We have a large selection of clothing, shoes, belts and handbags. With over 2000 of the most desirable labels in our inventory, you’re bound to find lots of rare and hard to find pieces as well as common necessities. Open toes, adjustable top buckle, wedge low heels, rubber. OPEN TOE SLIP-ON BUCKLE SHOES SIZE 5.5M. Good pre-owned condition, blue patent leather slip-on shoes. sole and man made patent leather. length toe to heel ~ 9". Condition is Pre-owned. The pictured color may be slightly different. Good pre-owned Condition. Minor wear and tear. 2" HIGH HEELS. CV SIGNATURE. BLACK PATENT LEATHER SHOES. SIZE 9.5 B. Classic dressy pump. Square toe. Cushioned insole. Man-made outsole that provides traction and wear. 100% authentic. Made in Italy. Gorgeous Guiseppe Zanotti kitten heels. Excellent pre owned condition. 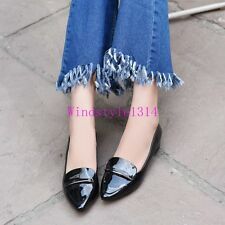 Denim trim on sides and back portion of shoes.. See Photos. Patent leather uppers. Leather lined. Marked Size: US 7. 3/4" heel height. 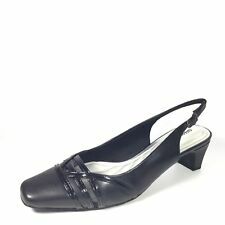 •Black patent leather style Mary Jane shoe in size 5. Has small fancy knotted elastic strap with across shoe and squared tie area. 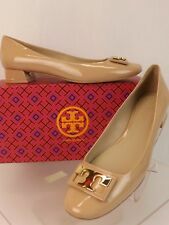 •The heels have minor scratch on heel, otherwise no noticeable issues. The pictures are actual and will best describe the item; what you see is what you will receive. We will accept the item back. Bandolino Wedge Slip On Size 9 New No Box Shipped with USPS Priority Mail. Heel Height - 1,5". Material: 100% Leather sole. Excellent pre-owned condition.